In the last issue of Coverage Opinions I mentioned the shock, during a recent visit to Graceland, of seeing Elvis’s parents’ homeowner’s policy on display. Issued by Camden Fire Insurance Company in 1947, the policy covered the Presley residence in Tupelo, Mississippi. Elvis was eleven years old at the time. While I was very excited to see that policy, and share a picture of it in the last issue of CO, it also left me with an unsatisfied feeling. What about a picture of a policy covering the Graceland mansion itself? And not now, but back in the day when Elvis called it home and was hanging out in the Jungle Room. [Google that if you need to.] Now that would be the holy grail for Elvis Insurance fans. So I contacted Graceland and asked if they could provide me with such a gem. Of course the request seemed a longshot. Do they even have such a policy? And if they did would they really send a picture of it to me. Actually, and more importantly, would they even think my request was serious? I think they would. No one could not possibly make it up. 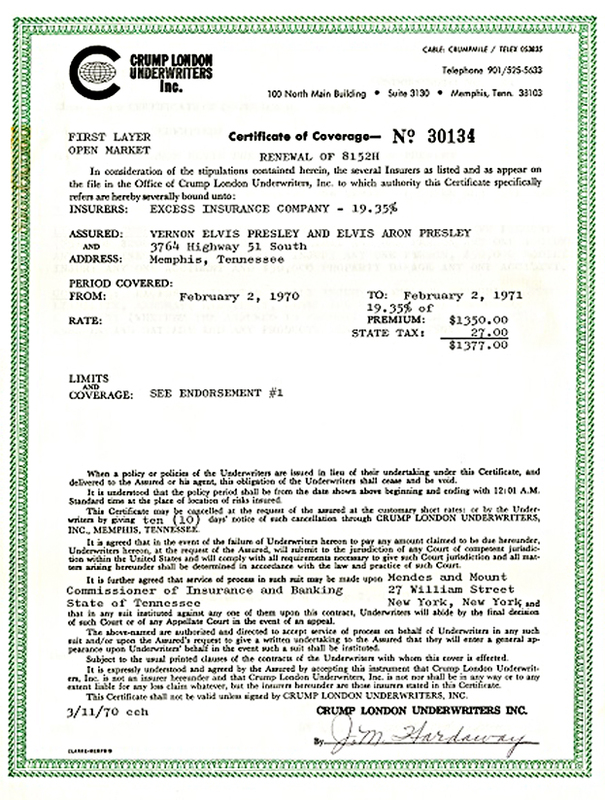 Well what a wonderful surprise it was when Graceland contacted me to say that it had found a 1970 policy, issued to Elvis at his Graceland address [3764 Highway 51 South, before it became 3764 Elvis Presley Boulevard.] And they’d be happy to let me use it for Coverage Opinions, no charge, if I signed a licensing agreement. A king size thank you to Elvis Presley Enterprises, Inc. for kindly letting me share this picture with CO readers. I can’t tell exactly what it covers but it looks like it’s part of an excess policy of some type.